Posts regarding MIAZ run (Meet In Arizona). The following are photos and a photo map from the trip down to Red’s MIAZ run. The final tally for the trip was 3866 miles in roughly 88 hours of travel time. After a good night’s sleep at the Super8 in Troy, Illinois, I checked weather and concluded that there was less chance of rain if I went home via Chicago instead of Indianapolis. In hindsight, maybe I should have taken the chance on the rain along the southern (and warmer) route. Truth be told, this was a fairly uneventful day. I got a late start because I took the time to write up the previous day’s post during breakfast (Texas waffle out of the Super8 waffle maker). It was still a little chilly with temps in the upper 40s (F) and broken clouds in the sky. 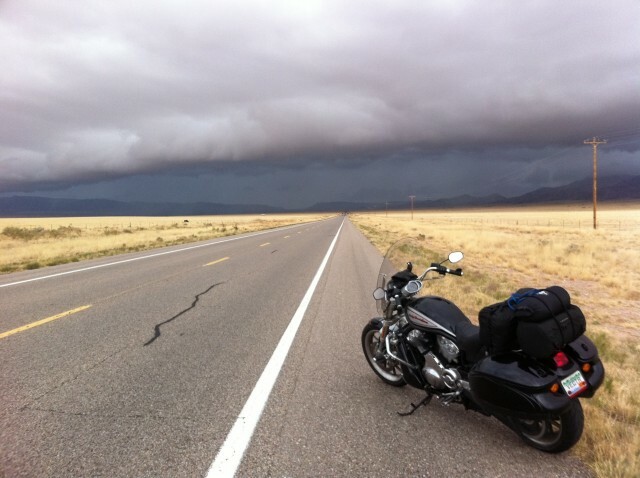 The wind was in my face but not oppressive like the winds I encountered during the ride down. I knew there was some weather in front of me. There was rainy weather out in Oklahoma City, Oklahoma to Joplin, Missouri and that system would be moving east-north-east, or basically directly along my path of I44. The question wasn’t whether I would catch the system, but when. So, the day passed, the Vector droned on, and the miles rolled. The morning in Superior, Arizona was cool and clear. Checking the forecast for a few cities and towns along my route, it looked like there was a good chance that the nasty winds that I encountered on they way down were waiting to torture me on the way back too. It also looked like it would be chilly, with temperatures in the 35-50˚F range. 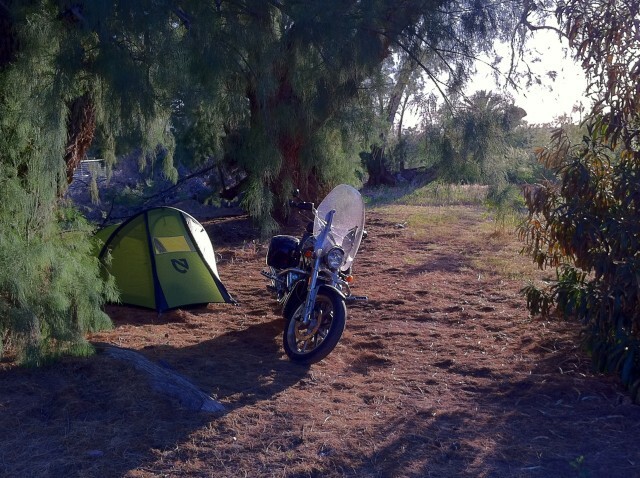 The sun is close to setting on my impromptu camp site at Red’s MIAZ gathering. 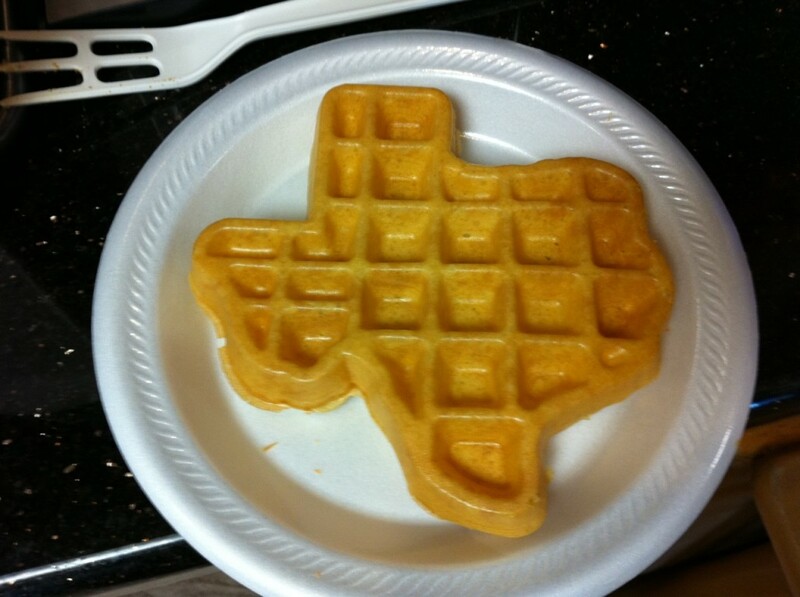 If you get breakfast at the Super8 (Lakeside Exit) in Amarillo, Texas, this is the shape of the waffles they provide. Pretty cool, actually. The last time I went down to Red’s MIAZ (Meet In Arizona) gathering, I got nearly all the way to St. Louis, Missouri on the first evening’s ride. This time, as noted in my previous post, I only got to Springfield, Illinois, which meant that I would need to make up the lost hour the next day. That would be a challenge since this day was to be 800+ miles anyway. The good news is that there wasn’t a drop of rain in the forecast. The bad news is that there was a steady strong wind coming from the west and I would be doing battle with it all day.